Pigmentation is due to deposition of melanin into the connective tissue without an increase in the number or size of melanocytes, and lesions are therefore flat. This may become more pronounced in areas of chronic trauma or inflammation, such as along the occlusal bite line of the buccal mucosa. 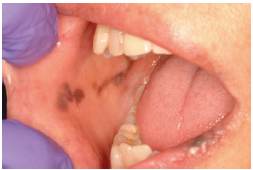 Post inflammatory pigmentation of the right buccal mucosa secondary to chronic cheek biting.